WhatsApp needs no real introduction. It's now the world's most popular instant messaging service, and we love it to pieces. As a show of appreciation for WhatsApp and the joy it brings into our lives, we've decided to compile a comprehensive list of WhatsApp tips and tricks to help AndroidPIT readers get the most out of the app. Here are our answers to some of the most commonly asked questions about WhatsApp, and some new tips for creating WhatsApp Statuses, GIFs and more. Voice messages are played through the main speakers on your smartphone, and will usually allow all of your nearest and dearest to listen in as well. There is a deceptively simple solution for this issue: just hold the phone to your ear. The proximity sensor will think it is a standard phone call and will automatically switch speakers. When you send a voice message via WhatsApp you need to hold the record button. As soon as you stop pressing the button, the message will be sent. That said, you are still able to cancel these messages. Just slide your finger to the left of the input field and a small trash can will appear. This indicates that your message has been deleted. How do I mark a favorite WhatsApp message? If you are a heavy WhatsApp user you'll be writing and receiving a lot of messages. For one reason or another, you may want to have some of these messages more readily available than others. Go to the conversation and press down on the message you want to bookmark, all you need to do then is press on the star in the new menu at the top. To access your favorite messages, go to the main window and click on the three vertical dots. Then enter the "Starred Messages" tab and you will find your favorites there. Searching is not limited to finding your contacts. If you have had a long conversation with a contact and you want to find a specific message, you can easily access it. Go to the conversation and click on the three vertical dots in the top menu, click on search and then just enter your key search words. In addition to searching, you can see your whole contacts list by going to the messages tab and tapping the tiny message icon on the top right of the screen. Just follow the same procedure as above to find your contact, except this time you will need to press on the paperclip and choose "Document." You can then access your memory, select the file you want and send. You can also send multiple files at once. In some circumstances, you may need to send your exact location or send the phone number of another contact. All you need to do is go to the chat window for your contact, and then click on the top right paperclip. In the menu select "Location" (obviously) and you will be given multiple options. Select the option which best fits where your current location is, and it will be sent to your contact. As a general rule, the Play Store will notify you when your apps can be updated. Of course, you are able to check whether a new version is available by visiting the Play Store, click on "my apps" and you will be able to see if any updates are available. If you don't want to wait for the update to become available in the Play Store, you can always go to the APK file and install it manually. If you'd like to see what's new in WhatsApp, we recommend you wait for a WhatsApp beta to become available. First, head to Settings > Security > Unknown sources and ensure the box is checked. Like many apps, Facebook / WhatsApp offers its users the opportunity to test new features in a pre-release version. Once you're all signed up you can install the beta version of WhatsApp from the Play Store. If for whatever reason are unable to use your hands, you should know that you can go through Google Now to send messages via WhatsApp entirely by speech interface. Simply start it manually or say "Okay Google" (if you have it voice enabled), and then say "Send to #message #contact on WhatsApp." For example, "send Cuckoo Carole on WhatsApp." The application will then ask you to confirm, so you can either press the arrow or confirm vocally. How do I make an audio or video call using WhatsApp? Nothing could be easier! On the conversation window you will find in the top right the symbol of a phone next to the paperclip. Press it, and the application will ask if you want to make an audio or video call. Just select your preferred function and the call will start. How do I add photos and video to my WhatsApp Status? The process is nearly the same as with text statuses, but the new feature allows you to post photos and videos which disappear after a day, just like Snapchat. You can edit them to add emojis, text, stickers and more. To create and send a GIF, check out our tip above. If you send a photo or video by accident, you can remove it before your friends see it. Just go to the Status tab, tap the three dots next to your status and then tap the little trash can icon at the top right. How do I find out who looked at my WhatsApp Status photo or video? Just like Snapchat or Instagram, the new WhatsApp Status feature allows users to post videos and photos which last 24 hours as part of their status updates. As with these other apps, you can also see who has viewed your photo or video status updates. Simply go to the Status tab, open the published status and swipe up from the bottom of the screen to see a list of who has viewed it. You can take a video and convert it into a GIF to share. Tap the camera icon in a conversation, record a video, then hit OK. When the video trimming page pops up, tap the camcorder icon on the upper right and it will switch to a GIF icon. Then you can send your up-to-six-second-long video as a GIF. Tap the emoji button and you can choose between the GIF and emoji modes on the bar that shows up at the bottom. Choose GIF and you can see a list of popular emoji or search by keyword for just the right GIF for the occasion. The GIF feature is from either Giphy or Tenor, with users split between the two services evenly. This works the same on Android as it does on the PC web version of WhatsApp. How do I delete photos and videos sent via WhatsApp? WhatsApp can be annoying sometimes because every time you send a picture or a video, it is saved to your phone. For instance, if you took a photo in town today and then sent it to a friend, that photo will be stuck not only in your photo file but also in your WhatsApp conversation. You can delete these manually. Just go to the WhatsApp folder in your phone's internal memory to the media file and select what you want to delete, and then go to the "Sent" folder and select the items you want to delete. When you receive a lot of images via WhatsApp, you don't always want them to be downloaded by default. This isn't only because they are not that interesting, downloading them consumes a lot of data. Fear not, you can disable the annoying automatic download. Instead, you will need to validate the download manually. Go to the settings menu then "Data Usage". You can then choose which items can be downloaded automatically with mobile data, WiFi or roaming. Simply click on the configuration that you want, for example "using mobile data", and then select your preferred options - you can ignore the ones you don't want. It's actually very simple. Open the conversation with the contact, press the "Menu" key and select "Block." If you decide its time to start talking again, you can find your list of blocked contacts in Settings > My Account > Privacy. Since WhatsApp version 2.1.23 was introduced it has been possible to block and report users if you receive messages you don't like or they are spamming you. You'll be offered this option every time, unless the contact is already in your address book. If you do not want to receive calls from certain contacts, you can simply block them. To do this, go to the WhatsApp Settings, select "My Account" adn then "Privacy". You will find "Blocked", and the procedure for blocking contacts will be outlined in there. In the new window, click on the small icon at the top right and choose the contacts to block. There are four ways to suss whether someone has blocked you on WhatsApp. Each sign is largely meaningless by itself, but together they form a solid reason to believe that your friend doesn't want to be your friend. Take note that WhatsApp has deliberately made it difficult to tell whether someone has blocked you or not, in order to maintain users' privacy. There's always an outlying chance that you're just being paranoid, even when all four of the below points apply. A contact's 'last seen' time appears in the top bar right under their name. If there's no information about when they were last online, this could be a bad sign. It doesn't necessarily mean that they've blocked you – it is possible to stop this information appearing without blocking someone. Your friend might just value their privacy, so don't go burning bridges just yet. Read on. Check marks are WhatsApp's way of compounding your obsessive streak by ensuring that you know what's going on on the other end of the line. The first check mark means that your message has been sent. When the second one appears, your message has been received by the recipient's phone. This doesn’t mean that the person has read your message, just that it is on their phone; when those check marks turn blue, that's when they have seen the message. If you see the check marks turn blue, they haven't blocked you, and everything is fine. Take a deep breath. There's a vague chance they still love you, though, surely? Time to keep digging. Do your calls go through? Again, maybe their phone is broken, maybe they've changed their number, etc, etc, but if this one is true and the two signs above it are, too – well, things aren't looking good, are they? Has their picture or profile changed? If you notice that a contact hasn’t updated or changed their profile in a while, or they've had the same picture for months, this could mean that they’ve blocked you. Or that they just never update their profile. Maybe everything is fine. Let's go a step further and check from a different account, meaning from a mutual friend’s smartphone. If you see here that your estranged friend's profile information and picture have changed, then we're sorry to break it you, but your friend has blocked you and, given how strangely you've been acting, with good reason. How do I mute those annoying WhatsApp group chats? We've all been here. You've somehow been dragged into a group chat that you either didn't really want to be in in the first place or just don't want to receive notifications from every couple of minutes. Rather than just leave the chat, which may offend some people, you can simply mute the chat so you stop receiving notifications from it. In WhatsApp, select the "Chats" tab and then tap on the group you want to mute. With the group open, tap the Options icon at the top right. Tap Mute, then select the amount of time you want to mute the group for. You can also untick the Show notifications box so that you never hear from the group again until you decide otherwise. Some conversations are not for further circulation. WhatsApp helps you along here by allowing you to use a PIN to access the app, so all you will need to do is remember your numbers. Some smartphone manufacturers will offer this feature by default, a good example here is the App Locker on OnePlus models, but if it isn't already in your device you can easily download an app that will do this for you. Your choices here include Messenger and Chat Lock, App Locker or CM Security AppLock AntiVirus. This is a great feature as it gives your WhatsApp an added layer of security. Go to settings, My Account > Verification in two stages. You can then choose to receive a verification email when you need to login to WhatsApp, such as when you're using another device. For anyone wanting to leave WhatsApp, it is possible to delete your account. If you do decide on this option, you should know that all of your contacts, message history and other settings will be deleted completely, and you will not be able to restore this data if you end up changing your mind. If you are accepting of all of this and really, really want to delete WhatsApp, go to "Settings" and then enter the "My Account" tab. You will then find the "Delete my account" option. Confirm your selection by pressing the "Delete my account" tab. Firstly, don't panic. If your device has been stolen your best option is to remove the number from your network, or at least to block the SIM card. If for whatever reason you aren't able to do any of this - again don't panic, you can deactivate your account via email. That said, this option is not effective if the thief can connect to your WhatsApp account. Just send an email clearly outlining your situation and a specific request to deactivate your WhatsApp account. Once you send the message, you'll have 30 days notice prior to deactivation. In other words, if you reconnect within 30 days after sending the email, the procedure will be canceled. In the body of the email, type "Please deactivate my account. # 33 your-number"
After following these steps, please send email to support@whatsapp.com. If necessary, WhatsApp will contact you for more information concerning your request. You can get floating notifications, or Chat Heads, by using the WhatsBubbles app. Here you will get floating notifications that are similar to those you find on Facebook Messenger. Another application you could consider using is SeeBye Chat Heads, which will also give you floating notifications but you will need root rights to use this app. How do I completely disable WhatsApp notifications? Do you have that many contacts that you are receiving a notification every 30 seconds? The simple solution would be to just turn them off. To do this, all you need to do is go to "Settings" and you will find this option either in the notification options or in the application options itself. You can then disable your notifications. Getting a little tired of hearing an alert every 10 seconds? Just turn them off! Enter the "Settings" and then in the notifications menu, you can choose whether or not a noise will announce the arrival of any new messages. An alternate method is to simply press and hold on a conversation from the main window, then click the crossed-out speaker at the top right. How do I respond to WhatsApp messages from pop-ups? If notifications are not enough, you can configure WhatsApp to open a window in the middle of your screen when you receive a message. You can then quickly respond directly from this window without having to open the entire application. To enable these pop-ups, enter the "Settings", go to "Notifications" and then select "Popup notification". All you'll need to do is go to the WhatsApp website and download the app directly from the site. The identification process is the same: you will still need to connect your smartphone to your PC using a QR code. Once you've got past this part, you'll then be able to chat directly from your computer. It's important to note that WhatsApp can only be installed if your computer's operating system is Windows 8 (or newer) or Mac OSX 10.9 (or newer). For any other operating systems, it's recommended you refer to the WhatsApp website for further information. Don't want people to spot the content of your chats on your computer screen? You can delete your chat history on your computer and the change will also be reflected on your phone. How can I change the chat window color on WhatsApp for PC? Like changing the wallpaper or background color of your WhatsApp chats on your smartphone, you can also change the background color of your PC chats. Open up the Web or PC version of WhatsApp and tap the three dots icon, then go to Settings and select a new background color. It's that easy! Doing so changes the background color for all of your chats, though, not just individual ones. It's possible to have multiple administrators within a group chat, and any admin within a group can make another participant an admin. All you'll need to do is access the group information and select the member of the group you want to make an admin. Then tap "Make group admin." WhatsApp allows you to store your conversations so they no longer appear on your "Chats" screen, but can still access it later if you need them. To do this, go to the chats screen and long press on the chat you want to hide. On the top bar select, the "Archive" icon. Here you have to make a choice as to what you want to do with your messages. Delete means your conversations will be removed entirely and you will not be able to recover them. Erase is more or less the same, but you will be able to retrieve these messages after a restore. You'll find these options via Settings > Discussions > Chat History. You can also delete a specific conversation directly from the chats screen. How do I send a WhatsApp message to multiple contacts through a group? Sending in bulk is a great way of circulating information without the hassle of forwarding individual messages to multiple contacts. To create a new group, tap on the "Menu button" and select "New group." Select the contacts you want to add to your group and then tap on the green arrow. Once your group is set up you and all your friends will be able to chat in real time. How do I send a WhatsApp message to multiple contacts via a mailing list? If you want to send the same message to several contacts, but do not necessarily want all of them to chat with one another about it, you can always create a mailing list. All you need to do is tap on the three dots in the top right-hand corner of the chat screen, and then select "Broadcast lists." Then select your contacts and save your list to your app. 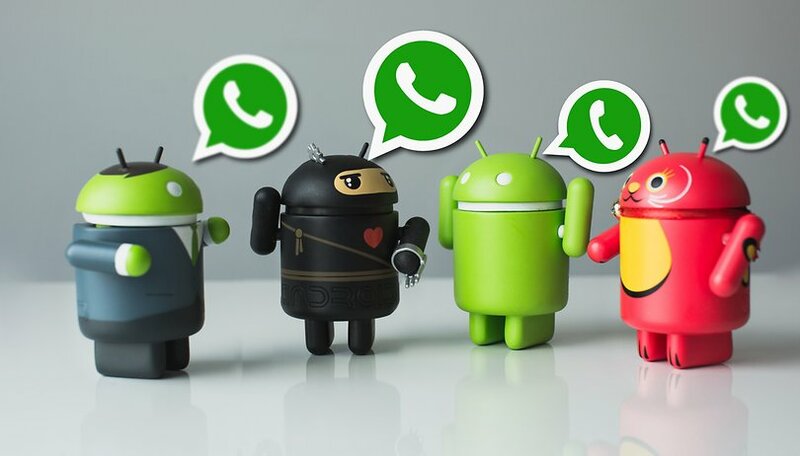 While it is possible for you to send automatic messages on WhatsApp, you will need a rooted smartphone to do so. Don't despair, as all is not lost. You can download Seebye Scheduler ROOT, which will allow you to configure your device. The app is very intuitive, so all you will need to do is name your process, select the contacts and then configure the date, time and content of the message. How can I chat faster on WhatsApp? Like many other apps, you can send messages using the "Enter" key instead of skipping a line. Just go to the settings, and then in "Discussions" select "Enter is send." Texting actually consumes very little data, but calls and sending pictures and videos will easily eat into your allowance. Rest assured, there are methods available to help you get around this issue. Enter the settings and in the "Data usage" tab select "Low data usage." Unless you reset the app, WhatApp automatically scans how many messages, data and calls you've sent and received. To access this information you'll need to go to the settings and open "Data usage." In the "Network usage" tab you will find all the data you've been looking for. It's now possible to use a widget as a shortcut to your favorite WhatsApp conversations. Go to the widgets list - which will usually come up after a long press on the home screen - and select "WhatsApp discussions." You'll then be asked which conversation you want to select and all that needs to be done is to validate your choice. Alternatively, in the conversation window enter the options in the right-hand corner and click "More." You'll find the "Add shortcut" option, which will then be automatically placed on your locked screen. How do I change the WhatsApp font size? If for some reason you want a bigger or smaller font, you can easily change this in the options. Click the three vertical dots at the top right-hand corner to open the settings, then enter "Chats" and then "Font Size". It's up to you to choose which one you prefer. How do I change the wallpaper on WhatsApp? When you see the blue ticks at the side of your messages, this means they have been read by the recipient. This also the case for any messages you send to a contact. There may be times that you don't want your contacts to know you have read their messages, so WhatsApp allows you to cover yourselves on these occasions. That said, you can disable the read receipts but this also means you will not know whether your own messages are being read. If you're willing to take that chance, just go to the options and enter "Account" and "Privacy." All you need to do now is uncheck "Read receipts." Maybe there are some key words or phrases you really want to stand out in your WhatsApp messages. For bold text just put your word or phrase between two *, and for italics between two _. You can even do both! You can select a message as unread so you don't forget it. This can be useful if you read a message when you are not able to respond, as this will enable to you remember that your contact is waiting for a reply. On the main window, press and hold the conversation once it has been validated (you will find the tick symbol next to your contact's profile photo). All you have to do then is tap on "Mark as read." It's possible to install WhatsApp on a tablet, but you must keep in mind that if you do you will not be able to use the app on your smartphone. If you've already configured WhatsApp to your number you'll still be able to use it even if the SIM card is no longer in it. If you have never set up your device with a phone number, well that's different. When you install WhatsApp, you need a phone number to check your device. That said, this number may very well be a fixed telephone number or another smartphone. In the verification phase, you receive the code by SMS so you can copy it to your device. Better yet, you can ask WhatsApp to call you directly to give you the code. Your WhatsApp account is associated with a number. If you change your number but want to keep your WhatsApp account as it is, all you need to do is contact WhatsApp and inform them that you have a new number. To do this, simply go to the three dots in the top right-hand corner, then in "My Account" select - of course - "Change number". Press "Next" at the top right, enter your old number in the first line, the new one in the second line and validate by clicking "Done" at the top right. Want to keep track of your chats? Nothing's easier. Just go to the chat window and click on the 3 points at the top right-hand corner, click on "More" and you will see an option which will allow you to send the conversation by email. How do I backup my WhatsApp conversations to my internal or external memory? Your conversations are recorded daily by default on your phone in the / WhatsApp / Databases in your internal memory or sdcard / WhatsApp / Databases in your external memory. You'll need to use this folder during restore in order for you to find all your conversations. How can I restore my WhatsApp chat history? When you reinstall WhatsApp it will ask you if you want to restore your chat history. By default you will be able to use the Google Drive system we saw above. Rename the file you want to restore (the save date is in the name) by giving it the name msgstore.db.crypt12. Do not change the crypt number if the name was in crypt10 or crypt9. Why settle for the Facebook version of WhatsApp if you can get something which will give you more freedom? The most popular of these is definitely WhatsApp Mods . It allows, among other things, to delete the camera and voice symbols, and to highlight (using another color) messages in group chats. You might enjoy WhatsApp Quiet Hours, which allows you to mute WhatsApp for a specific period of time. You'll be able to disable notifications, vibrations, and notification LEDs without changing your system settings. I regret to inform you that this is impossible. If you can not get the Internet, you will have to stick with good ol' text messaging. Anyone who says otherwise is trying to sell you a pup. This serves as a good prompt to remind you that sending and / or reading messages while behind the wheel is a really bad idea and I advise you avoid doing so. If you need to send a message urgently, I advise you to opt for the simplest solution: the voice interface. Google Now will be able to send a message to a WhatsApp contact if you ask. Do you use WhatsApp as your main messaging app? What's your own favorite tip or trick for using WhatsApp? Let us know in the comments below! Very good article. For me, the "Send Location" feature was very useful. It's a very interesting application. This is probably elementary but how do I get rid of the number "1" by the whatsapp logo when I know I have read every message and there are no new ones, yet that number makes it look as though I still have an unread message? Wow,I didn't know that I could create my own GIF's my mind is completely blown away and yes I have been living under a rock. you can see who views your status. I tried updating whatsapp manually using the merh9d you described but it shows me an error. Why? Thanks! These tips are indeed useful. I am not able to change the dp of my friend. I tried a lot. Anybody here tried and succeeded in changing ur friend's dp in whatsapp? you can not change your friends dp in whatsapp. To change others DP you have to change it in their own Mobiles. How to use two (2) whatsapp accounts on one phone? I use the app "parallel spaces" to have another whatsapp account on my dual SIM phone. How to enable the WhatsApp call in Android phone if it is blocked in your country? To activate the WhatsApp call in Android phone, you need to follow the below instructions. Fill all the information asked in the current tab such as your VPN name, type of VPN connection and as well as your VPN server address. However, you need to ensure that there are no extra symbols and characters in the VPN address. And, then save all these details. On the next tab, enter your username and password that you already received from your VPN account service. Once you configured your VPN and created an account, then it sends you the mail for password and username. Use this information on this tab and click connect. Once you have connected to the VPN service, will get a notification, and when you disconnect the VPN service, also you will receive a notification message. Do you want to enable WhatsApp VPN service on you iOS device? Then, it also almost similar to the android, so follow this same steps for iOS device too. By following the mentioned steps, you can able to unblock WhatsApp in Saudi Arabia and others Gulf countries. There is many ways to manage the data of WhatsApp. Like the images of WhatsApp, there are a lot will be generated everyday. Sometimes you might delete using some manager apps, if you want to recovery, you should use some 3rd party software like FonePaw Android Data Recover which can restore WhatsApp images from Android. One of the group members has recently reinstalled or changed phones (that is how it shows, when I tap on the security message for more info), from that time onwards messages in group are not getting delivered to that one person. But still that person has WhatsApp account. How is this possible? Today I noticed that while typing a message on whatsapp it suddenly stops & get down. So I have to ask the keyboard again to appear & start typing but this doesn't lady but less then a minute and so on? When you want to hide pictures from Album app, you need to create and rename the "file" to .nomedia (using ES Fileexplorer,) not the folder, adding a new folder and naming it that will not do anything. Mute annoying groups 😂 All groups in my whatsapp are blocked for one year without notification. Yeah Agree... Back up is also being done...! Nice article! was very helpful thanks for posting! The double device trick is awesome! Thanks fo these awesome tricks some of them are know and some of them are completely new for me. Thanks a lot! I'm just getting on this app, I know how come , but I used others. So thanks for the sum up!!! There are lot's of things you can do with your what's App but you need to Root your device. Thanks for useful whatsapp tips. How to add this article to my favorites? When I try to create .nomedia with ES File Explorer ( tip 1) I receive "Operation Failed"
I found it ! I had an hidden folder called ".nomedia" that now I have deleted!...Now all seems to be fine! Nope that is not possible . you can try this software " Backuptrans Android iPhone WhatsApp Transfer "
Maybe you have installed a app that kills background running apps . For example if you have a app like clean master, battery doctor, phone booster apk it will close all background running apps to save battery. So either uninstall it or remove whatsapp from their list . Go to settings and find a notifications in a pop-up window and tick it. Yes you help me a lot in WhatsApp tips & tricks. Something to hide the online status? Nope, you can't hide online status on official whatsapp. Hey Scott, can l please get that awesome clouds wallpaper? Simple and useful. Thumps up. This is Great.. Wonderful whatsapp Tips Thanks.. Interesting..
thanks for sharing with us these tips Robert. sometimes one forget these things and when I do articles like these on Android Pit are a excellent guide and excellent to those that want to learn more about their devices and apps on their devices. I have a Samsung Galaxy A5 and i would like to know how I can stop my whatsapp messages from showing up on my recent apps list. the moment i open whatsapp, chat then close the app, if I press on the soft key at the bottom left of my phone it shows all the recent apps that I've used including all my chats. I would like to know how to stop these from showing on my recent apps list instead of me doing it all manually. It's a basic how to in whatsapp.